Cheryl took the manual outside. This was not the first time this had happened. This was, however, the first time under the watch of Ethel’s new smoke detector, and this time it was not as easy as pushing a button or taking out the battery. The pounding on the ceiling in Betty’s flat below was only adding to the consternation. As Ethel chased the smoke out, Cheryl quickly scanned the instruction book for answers. 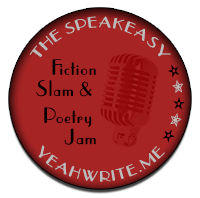 Here are the Editor’s instructions for this week’s submission… Welcome back, dearest bootleggers, to the third week of November here at the Speakeasy! This week, our sentence prompt, provided by last week’s popular vote winner Stacie, must be used as the FIRST line in your piece. And our media prompt this week is a painting, which you will find below. As with all our media prompts, your post shouldn’t be about the painting, but you must make some sort of reference to it in your submission. 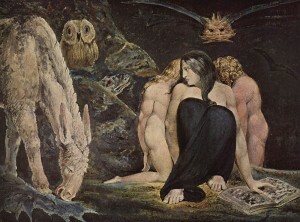 The painting is by William Blake and is titled The Night of Enitharmon’s Joy… 1795. Starting a fire with the flue closed…hahaha…but, “oops!” This was a funny scene and it brings back memories of childhood with some wood stove mishaps much like this. lol, this cracked me up!! And I am growing to like Ethel, I have to be honest. I look forward to seeing what she’s gotten herself into next week. I see so much of myself in Ethel I’m starting to worry! 😉 Funny and a great read! Very cute and funny, great job. Thanks for the shout-out! This cracked me up. I love the whole going high tech but then having no idea how to use it. those two ladies…please keep them alive and vital ! I love these two so much! They should really have their own show. Great job with the prompts, Ted! When I read last’s week for the first time I didn’t quite get it, but now I see and like how you have the two characters that play off each other and make the reader a part of the fun. Cheryl and Ethel will never have any reason to complain about my smoking again! Loved the story Ted! !